A small village with nothing much to do except for to stand in awe as the mighty Himalayas loom over your head. Naddi is not far from McLeod Ganj and Dharamsala- where 10,000s of neo-hippy backpackers descend every year to visit the Dalai Lama. Although McLeod Ganj is in the middle of the world’s highest mountains, they, much like the Dalai Lama by the way, are rarely seen there as it’s simply too crowded to get a good view of the mountain range. But make your way over to Naddi, less than 10km away, and you’ll find the a whole massive range of 5000m high peaks stretching out in front of you. As well as a few goats. But not much else. In Himachal Pradesh, at the foothills of the Dhauladhar range of the Himalayas, 15 minutes from McLeod Ganj. Map. 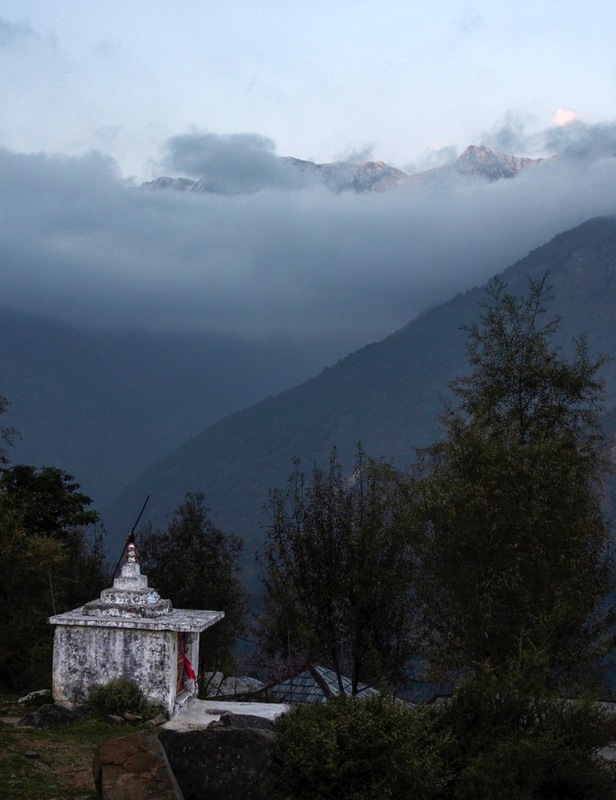 EVER SINCE THE Dalai Lama rocked up in 1960, McLeod Ganj (a suburb of Dharamsala) has attracted a steady stream of backpackers and spiritual seekers. It’s true that McLeod Ganj’s permanent community of expatriate Tibetans gives the place a unique flavour- at the same time the Dalai Lama himself is too busy hobnobbing with Richard Gere and other Key Opinon Leaders to spend much time with his government-in-exile in this dusty little provincial town. But if it’s Tibetan culture you’re after, you should consider giving McLeod Ganj a miss in lieu of Ladakh, which is arguably more Tibetan than Tibet itself, and where Tibetan Buddhism is native, and not a recent import practiced by a few newly arrived exiles. The other theoretical attraction of Dharamsala are the Himalayas- but although the town is built on the edge of the mighty Dhauladar range at an elevation of about 2000m, you don’t get to really appreciate the mighty mountains: too many backpackers hostels serving banana pancakes and momos (Tibetan fast food) are blocking the view. To get a real sense for the mountains, you have to leave. 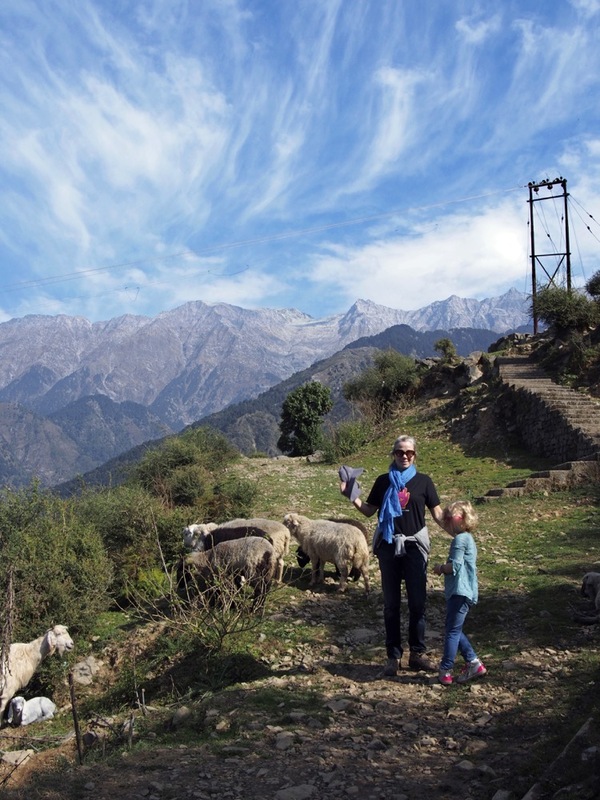 While there are certainly many options to embark on treks or other adventures near McLeod Ganj, an easy but much overlooked option is to hitch a quick ride to the nearby village of Naddi, which commands a superb and undisturbed view of the stunning Dhauladhar range. You’ll see the odd Indian tour group making a brief stop in Naddi to snap a few pictures of the mountains before they rush on to their next stop (Indian tourists tend not to waste time lingering), but if you settle in one of the friendly guesthouses you’ll have the chance to enjoy breakfast (and lunch, and dinner) with a view you’ll never, ever, forget. Breakfast time at Udechee Huts. One of the best places to enjoy your breakfast is the rooftop terrace of Udechee Huts. 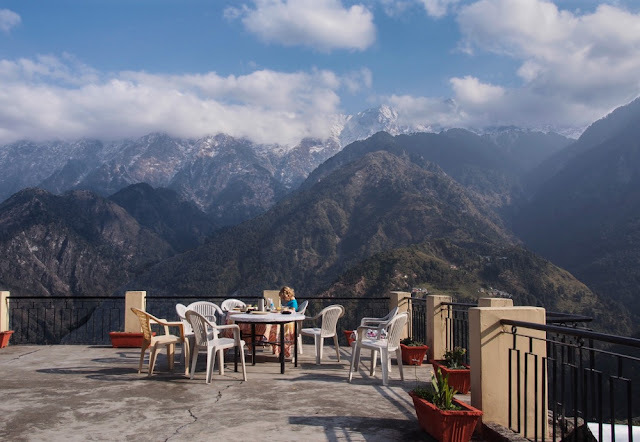 Made of strictly utilitarian concrete, and furnished with even more utilitarian plastic chairs, it offers a 270º view of the Dhauladhar range, and serves a mean masala chai. Naddi offers little in the way of formal entertainment, and even banana pancakes are hard to get by (dhal and chapattis are a typical, and filling, breakfast.) 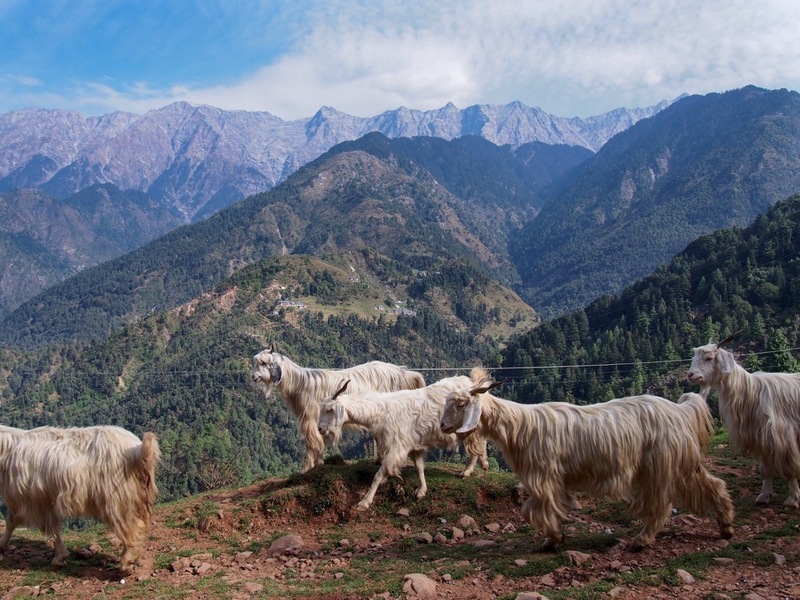 But what it lacks in man-made attractions is richly compensated by natural attractions: flocks of chirping green parakeets, herds of pashmina goats and lots, lots of fresh air. 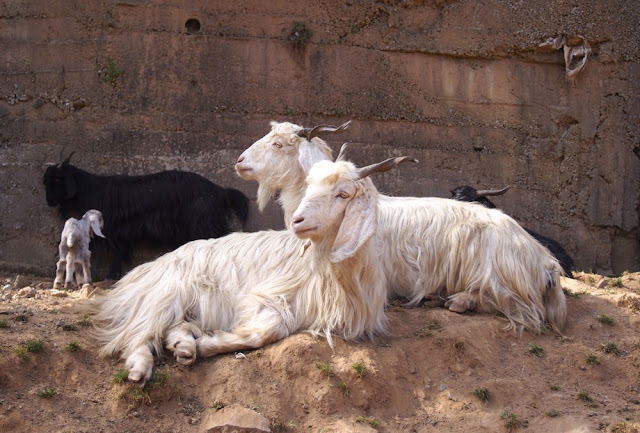 Pashmina goats- the source of those expensive shawls. The main highway to the next village. 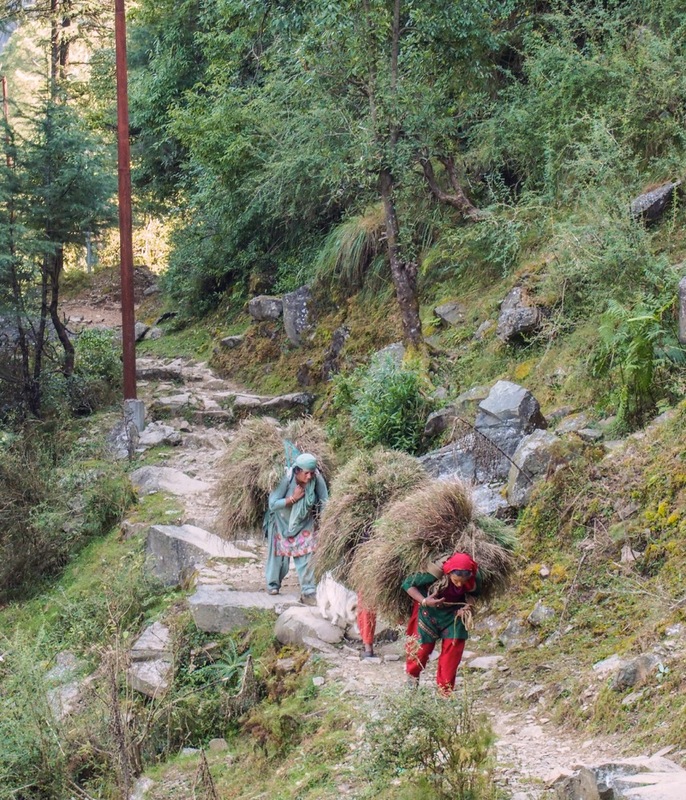 It's easy to strike out for hikes short or long, either for one of the neighbouring villages or even the Bhagsu waterfalls across the valley. The hills are alive... with the sound of goats! Although not particular strenuous, travel to Naddi involves several hops. The nearest airport is at Gaggal about an hour away and if you’re travelling by train, you can trundle up to Kangra station on the Kangra Valley Railway from Pathankot Junction. If you’ve booked a guesthouse in Naddi they can send a car to pick you up- otherwise, a taxi is easily arranged from McLeod Ganj. Udechee Huts can be contacted through their website. You're welcome! Are you planning to visit Naddi?